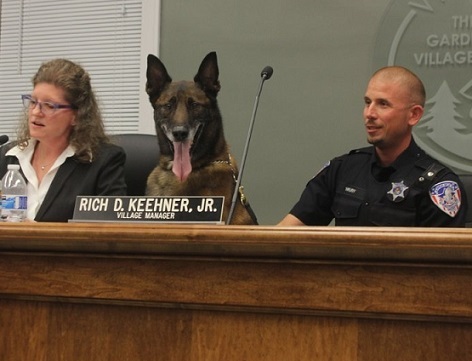 After eight years of dedicated service to Villa Park, Police Canine Inoe retired Aug. 4, 2015. Inoe began his career at the Village of Villa Park when he was selected as a Canine for the Villa Park Police Department in November 2007. Inoe was partnered with Officer Bryan Hruby at Northern Michigan K-9 Training, Inc. in Harrison, Mich. for four weeks of intensive canine training and after returning to Villa Park, Officer Hruby and Inoe spent the next several months completing the state required training and testing to successfully achieve his required Yearly Illinois State Certification. Inoe assisted in many arrests by locating narcotics. As a cross-trained dual purpose narcotics detection canine, Inoe was responsible for assisting in search warrants, vehicle sniffs and residential sniffs locating more than three quarters of a million dollars in drug money located in a hidden trap, heroin and his largest single find of five pounds of marijuana in one traffic stop. Inoe was credited for saving a young girl’s life while assisting a neighboring town. He tracked during subzero February temperatures and located the missing girl who was lost and had no idea where she was or how to get to safety. In addition to his work on the street, Inoe was a regular guest in schools, local events and area canine demonstrations where his easy manner and friendliness was appreciated by the citizens of Villa Park. Inoe retired from the Villa Park Police Department on Aug. 4, 2015.